Sunanda Pushkar's death came as a big tremor to not just her husband, friends and relatives but Bollywood too. After all, she was the typical socialite full of life who was prominent on the social circuit. She was lastly found in latest bollywood events. Starting her career as a receptionist at the Centaur Hotel in Srinagar, she later dabbled in Event Management and shot to fame as the owner of an IPL team Kochi Tuskers. It was at this time that Tharoor and Sunanda's affair came into the public glare and Tharoor was accused of over allocation of sweat equity to the value of Rs. 70 Crore to Pushkar by the IPL Kochi franchise. Tharoor was even forced to resign from the Ministerial post as there were many allegations from the opposition parties. When the BJP's Narendra Modi called Sunanda, 'Tharoor's 50 Crore girlfriend,' Shashi Tharoor came to Sunanda's rescue and called her priceless. 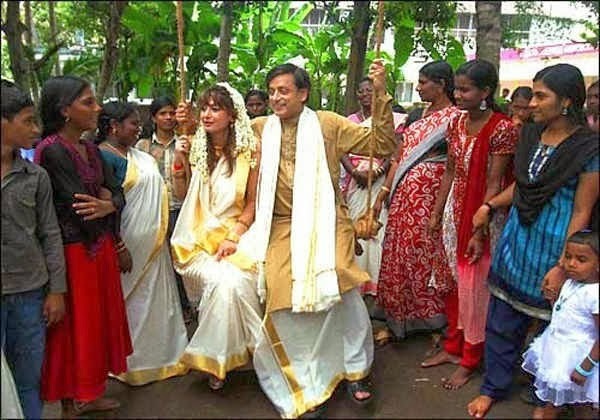 Later, when Sunanda Pushkar wed Shashi Tharoor in 2010, every single detail was public. It was not a love at first sight for them. 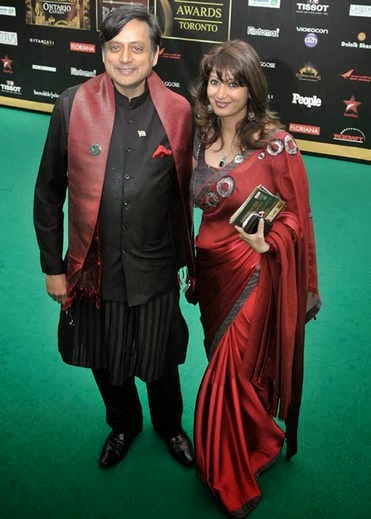 Shashi Tharoor and Sunanda Pushkar first met in 2008 at the Imperial Awards in New Delhi. Strangely, their second meeting in Dubai turned out to be significant. Shashi proposed to Sunanda and the two exchanged rings in 2010 at Kasauli. After two long years of courtship, they tied the knot on August 22, 2010. It was the third marriage for both. Sunanda's first marriage with Sanjay Raina when she was 19 broke up and a few years later, she married Sujith Menon, a close friend of her former husband. The couple then shifted to Dubai where she started her own Event Management Company. Later, in 1997, Sujith Menon died in a road accident in India. On 15 January 2014, a series of intimate messages, supposedly sent by the Pakistani journalist Mehr Tarar to Tharoor, were posted on Tharoor's Twitter account. The messages declared Tarar's love for Tharoor. Tharoor tried to downplay the incident by stating that his account had been hacked. However, Sunanda later stated that the account had not been hacked and that she had posted the messages to expose what she believed to be Mehr's stalking of her husband. She accused Mehr of being an ISI agent. Later, she stated that she did not want to go public about the matter, particularly in an election year.The next day, a note titled as "Joint statement by Sunanda and Shashi Tharoor" was published on Shashi Tharoor's Facebook page. The note stated that the couple was happily married, and that some personal comments not envisioned for publication had been misrepresented after being posted to Twitter. The note also stated that Sunanda had been hospitalized after being ill, and was seeking rest. On 17 Jan, 2014, a day after the Twitter controversy, Sunanda was found dead in room number 345 of The Leela Palace hotel in the Chanakyapuri area of New Delhi. Shashi Tharoor discovered her body, when she did not wake up from her sleep in the evening. He conversant the Police, who recovered the dead body from the hotel and sent it for postmortem. According to initial reports, Sunanda was suspected to have committed suicide. The later reports stated that the cause of death was unnatural; the doctors at AIIMS gave a initial autopsy report that revealed injury marks on her body. The doctors said that these injuries may or may not be the cause of death. The autopsy specified that she died of drug overdose, most likely a combination of sedatives, other strong medicines and probably alcohol. Her body was cremated at Lodhi crematorium in South Delhi. Doctors at KIMS Hospital Trivandrum, who had diagnosed her few days’ earlier, say that she did not have serious health problems. However, Sunanda had hinted about her death, hours before her body was recovered from the hotel. However, sources revealed that Pushkar had several external injury marks on the upper part of her body, many of which seemed to be scuffle marks. The forensic experts were also handed over pictures of the crime scene as they wanted to see the condition in which Pushkar’s body was found. The three-member panel, headed by forensic medicine department Dr Sudhir Gupta, performed the post-mortem on Saturday morning. After examining the body for more than an hour, the doctors had labeled it as a ‘sudden unnatural death’, and asked for a couple of days more for a detailed examination. However, even after two days, doctors couldn’t clarify what the term ‘sudden unnatural death’ meant.